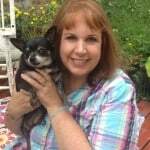 This post is sponsored by ProPlan BRIGHT MIND and the BlogPaws® Pet Influencer Network™. I am being compensated for helping enrich the lives of senior dogs, but we only share information we feel is relevant to our readers. Pro Plan BRIGHT MIND is not responsible for the content of this article. I have always thought that the only fault dogs have, is that they don’t live as long as we pet parents do. I think about this more and more as my 3 fur babies move into their senior dog years. 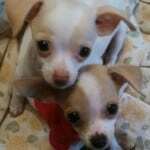 And I hear from so many of you going through the same thing with your beloved Chis. I am doing everything I can to keep my dogs around as long as possible and make their golden years happy and healthy. I worry about them. I can’t help it. It’s a mom thing I guess. I have been particularly worried about my lab-Australian mix Roxy. I just realized she will be 12 in July. For some reason, I thought she was only 9. Anyway, she has been having trouble getting up and down off the bed and couch and she has also been acting kind of weird. Multiple times at night, she keeps walking in and out of my office while I’m working. She comes up and puts her head in my lap and whines a little like she wants something. It drives me crazy because I can’t figure out what she wants. She is free-fed so there is always food and water available. We have a doggy-door so she can go out in the backyard whenever she wants. This behavior started about 6 months ago and she does it most every night. 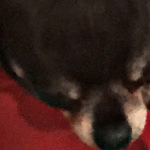 This is one of those times when I really wish dogs could talk because I have yet to figure out what she’s been trying to tell me. 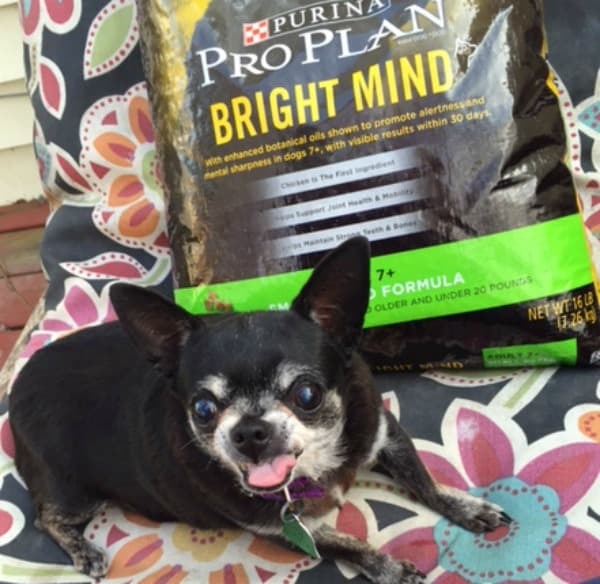 When I got the opportunity to try Purina Pro Plan® BRIGHT MIND Adult 7+® dry dog food, I jumped on it. 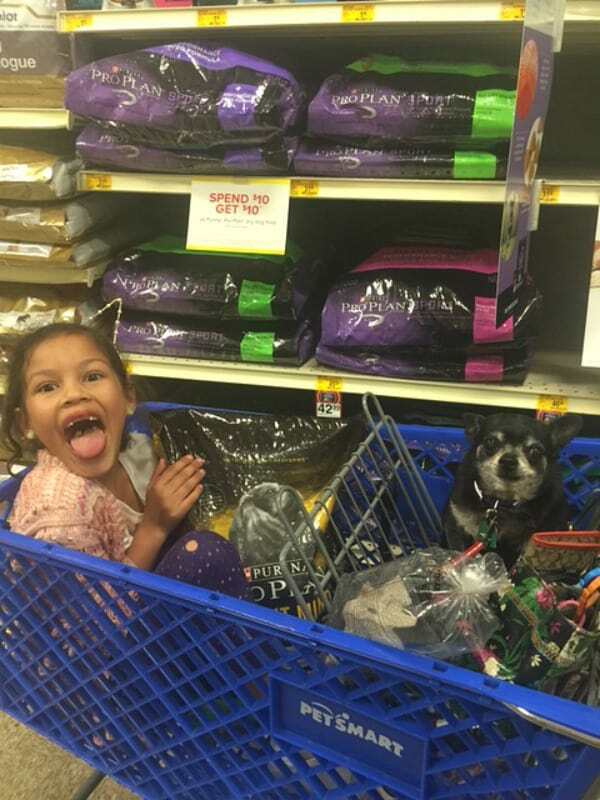 I took 2 of my favorite little girls (my granddaughter May and Kilo) down to my local PetSmart to pick up a bag. 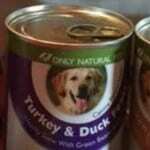 The kind I bought is for dogs over 7 and I got the small breed formula (easier for Kilo’s tiny mouth). 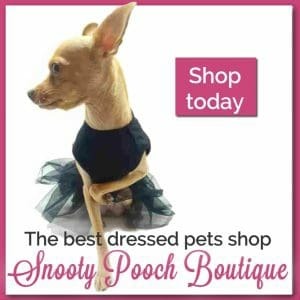 This was tailor made for my dogs. In reading up about this new formula, it’s supposed to help your aging pet become more alert and be more mentally sharp after about 30 days of being on this food. We haven’t been on this food for 30 days yet. The pupsters have been eating it a little over 2 weeks now so I haven’t expected to see any results yet. Except… I am actually seeing some changes in Roxy. I can’t claim it’s the Bright Minds food causing this. It hasn’t been 30 days yet. But the food is the only thing that has been changed in her life recently so I have to wonder if this food is what is causing the change. She’s not doing the weird wandering back and forth thing all night now. In fact, it’s been a week since she has done it at all. The other change is she can jump up and down without help now. This also has been going on for about a week. Here’s a short video of her jumping on the couch. I plan to buy another bag when this bag of food is gone to see if this improvement continues. Now I have to warn you, this food isn’t cheap but if it continues working, I’m okay with that. If you want to give it a try, for a limited time when you spend $10 on any Purina® Pro Plan® product, between 2/29 and 4/3 you will save $10 on your next purchase of Purina® Pro Plan® Dry Cat or Dry Dog Food (14lbs. 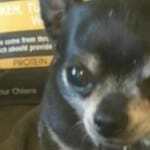 or larger) or Litter (6lbs or larger) by 5/1. If you’d like to learn more about this food, you can read more about it on their website. If you know you want to go ahead and buy it, you can purchase it at your local PetSmart or PetSmart’s online store. You can also check them out on social media here: Facebook, Twitter, Instagram. 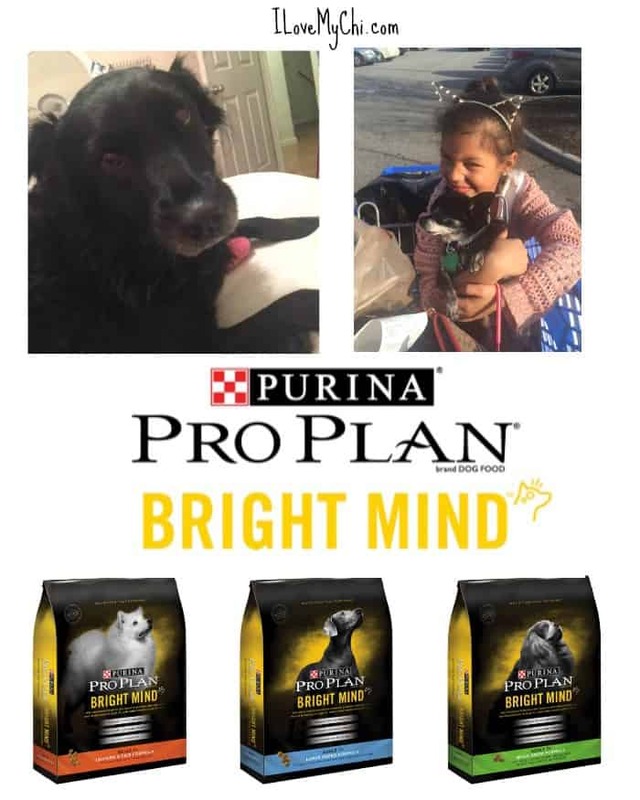 Please let me know if your dogs do try the Purina Pro Plan Bright Minds formula and what your results are. I’m really curious as to what others experiences are. 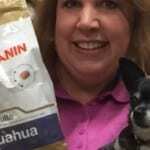 This post is sponsored by Pro Plan BRIGHT MIND and the BlogPaws® Pet Influencer Network. I am being compensated for helping enrich the lives of senior dogs, but we only share information we feel is relevant to our readers. Pro Plan BRIGHT MIND is not responsible for the content of this article. Can’t help out right now as things are tight at my house right now. 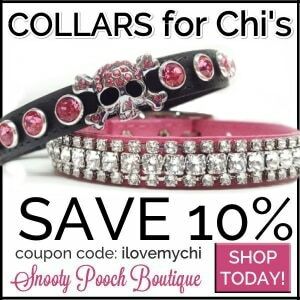 But love your chi page and my Joey has been posted many times there. Thanks for letting us be part of it. You’re welcome Dorothy! You are helping out just by coming over here and reading about this food. I had a Joey too but he was a terri-poo. Best dog I ever had and I still miss him every day. He lived to be 19. Joey is a rescue . I’ve had him for almost 3 years now. I just love him to the moon and back. That pic is kinda blurry on my site .How is it on yours? going to try again. This photo is a lot better. My Joey was a rescue too, taken from a hoarder. Your Joey has such pretty coloring. aaaah… Roxy is adorable! I’m really interested in this food.. I may just have to give it a try… thanks for posting about it! Thanks Joan. I think your dog will like it.